Equipped with a high-tech RT machine, you find it disappointing to test its performances with radiographic films? 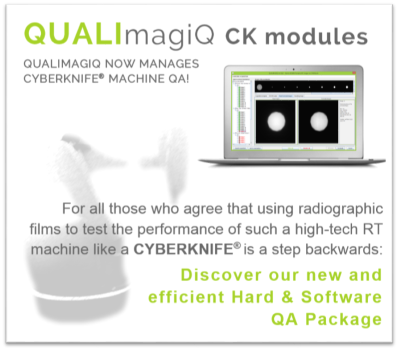 CYBERKNIFE® machine QA managed by QUALIMAGIQ! control every single beam, for all sessions and every Patient! Now TPS QA is fast, comprehensive and accurate ! QUALIFORMED is the fruit of two different cultures, German and French, and two separate areas of expertise, medical physics and computer science. The main objective is to simplify the performance and organisation of your QA, without making the slightest concession on either precision or scope. By shortening the time consecrated to the QA of your machines, it will be possible to perform them with a frequency compatible with the security and quality level your patients expect regarding their treatment. The time savings gained through use of your QA software solutions can be applied to implementing techniques and procedures which contribute to improved patient care.